Black Mass is the best kind of biopic. One that tells a very specific story. It doesn’t just exist in order to tell about a person for the mere sake of retelling their life story. We’ve all seen those before. At the end, you say to yourself that you feel like you know the person, but you’re not really sure why you needed to learn about arbitrary snippets from their life. 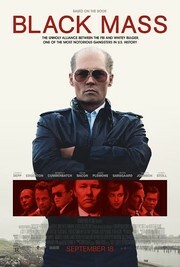 This film is about Whitey Bulger (Johnny Depp), a Boston crime lord, whom you can assume had some acquired some fairly heady anecdotes over the course of his reign. But Black Mass doesn’t just start from his childhood. It focuses mainly on the latter half of his life–after he was already established as a feared man in the city of Boston. The film details how he becomes an FBI informant who helps end the Mafia invasion in his territory of rule. But it never really paints him as a saint. In fact, it shows him more as the villain he is. One who is ruthless and merciless and only cares about his own power. Towards the beginning, before a series of events happen that takes away most of the people he cares about, we see flickers of a loving person. It’s after that when he becomes a monster. There is a secondary lead, John Connelly (Joel Edgerton), who works for the FBI but also grew up with Bulger. He has always been enamored with the criminal and secretly wants to be like him. He is in denial. Things start to change in his life when the FBI becomes fed up with Connelly always creating excuses for Bulger–a trend that may prove to work against him rather than for him. But Black Mass never chooses a protagonist for us. We root for certain characters, but then realize that they all may very well have faults of their own that make them unrootable. Depp is seriously phenomenal in his portrayal of Bulger. It may very well be his best performance in years, maybe ever. You forget it’s him because it is so far gone from the typical roles that he takes on. The film is gripping from beginning to end. It proves how there are different levels of nefariousness and depicts Bulger’s second tier of villain perfectly.